A senior delegation from the International Airlines Group (IAG), one of the world’s largest aviation groups, landed in Tel Aviv to scout the Israeli hi-tech ecosystem for cutting-edge innovation. Eight start-ups presented their innovative solutions to IAG executives during a dedicated pitch day at Tel Aviv’s newly-opened WeWork ToHa. “We scout globally, coming to places like Israel and anywhere where there are interesting tech communities working on new solutions,” Dupsy Abiola, IAG head of Global Innovation, told The Jerusalem Post. The delegation’s visit, led by Abiola, was particularly focused on scouting for start-ups and scale-ups developing solutions that can be utilized in the fields of logistics automation, identity management and biometrics. “Israel is one of the leading technology centers in the world, certainly for its size. There’s also a good trifecta of amazing education, sufficient funding to support the growth of the companies, and global outlook and talent that have the ability to grow a business, scale it and then start another one,” said Abiola. Petah Tikva-based BioBeat Technologies is one Israeli start-up that IAG has already recruited for its Hangar 51 accelerator program, aiming to provide its wearable medical monitoring device to cabin crew, pilots and travelers. The statement, “I think you can’t ignore Israel,” hits the nail on the head. While Israel is a relatively small country, approximately 21,000 square kilometers—a little larger than New Jersey—with a population of less than 9 million, this nation has surpassed many well-established Western nations. For example, life expectancy stands at 82.7 years, and per capita GDP was listed at $36,400 for 2017. Wikipedia states the town Petah Tikva was founded in 1878. The name Petah Tikva in Hebrew means “opening of hope.” It is based on Hosea 2:15: “And I will give her her vineyards from thence, and the valley of Achor for a door of hope: and she shall sing there, as in the days of her youth, and as in the day when she came up out of the land of Egypt.” A few verses down, it speaks of the future: “And in that day will I make a covenant for them with the beasts of the field and with the fowls of heaven, and with the creeping things of the ground: and I will break the bow and the sword and the battle out of the earth, and will make them to lie down safely” (verse 18). This town is somewhat unique since it was founded by mainly religious pioneers coming from Europe. Today, high-tech companies have moved into this industrial zone of Petah Tikva, home to Israeli headquarters of such firms as Oracle, IBM, Intel, Alcatel-Lucent, ECI Telecom, and GlaxoSmithKline Pharmaceuticals. #1083 Judgment and Restoration. 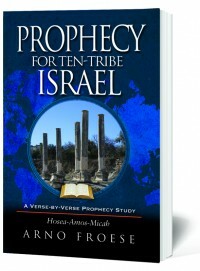 A verse-by-verse Prophecy Study of Hosea, Amos and Micah.